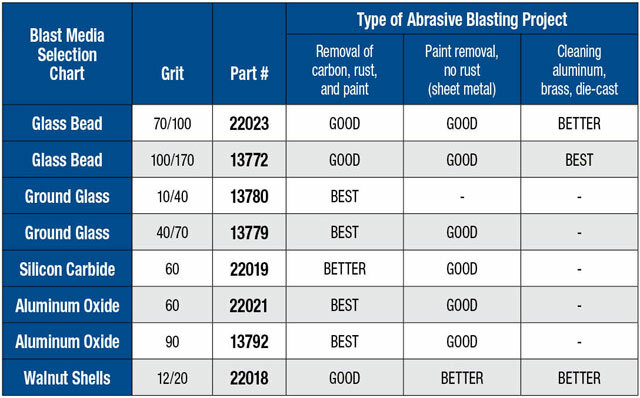 For your biggest abrasive-blasting jobs, you'll want our largest Blast Cabinet with Dust Collector System. Sandblasting big parts doesn't have to be a dirty job that deposits abrasive material all over your garage and shop. Done inside this Blast Cabinet, all that media stays inside, and the dust collector system neatly collects the excess. Sturdily built of 16-gauge, powder-coated, welded steel, with steel legs. Working dimensions: 60" wide, 35" deep. Overall dimensions: 65"W x 36"D x 58"H. Includes huge 12" x 45" acrylic plastic viewing window. 1-year limited mfr's. warranty. Made in the USA. Use with 60 grit or finer blast media. Use of Walnut shell media is not recommended.